The class I'm taking right now is History, Theory, and Philosophies of Art Education. 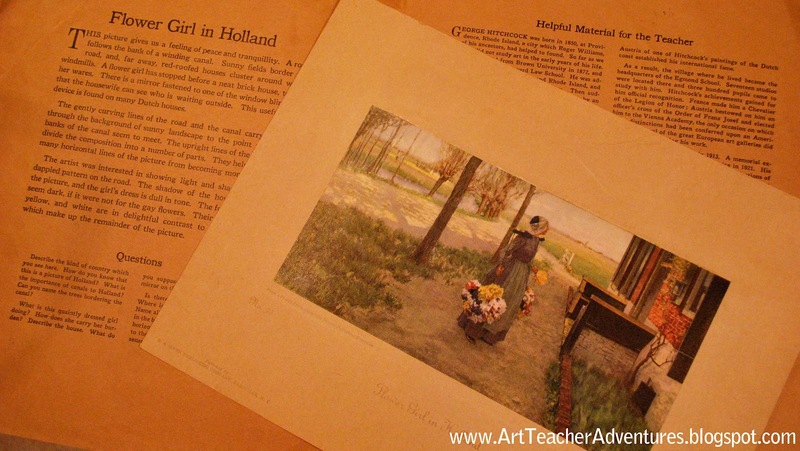 The module we just finished was about Art Education from 1900-1945. I read about how "picture study" was used to teach Art Appreciation and sometimes use Art to integrate other subjects. It reminded me of something my grandma gave me recently, so I pulled it out to re-examine it. 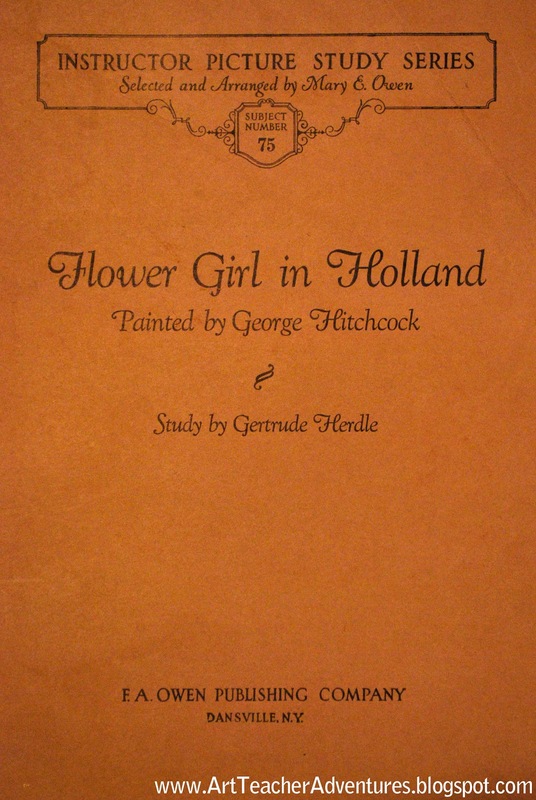 It was a teacher's edition of a picture study published in 1933 from the Instructor Picture Study Series, Selected and Arranged by Mary E. Owen, depicting Flower Girl in Holland painted by George Hitchcock. This picture gives us a feeling of peace and tranquility. A road follows the bank of a winding canal. Sunny fields border the road, and, far away, red-roofed houses cluster around white windmills. A flower girl has stopped before a neat brick house, to sell her wares. There is a mirror fastened to one of the window blinds, so that the housewife can see who is waiting outside. This useful little device is found on many Dutch houses. The gently curving lines of the road and the canal carry the eye through the background of sunny landscape to the point where the banks of the canal seem to meet. The upright lines of the tree trunks divide the composition into a number of parts. 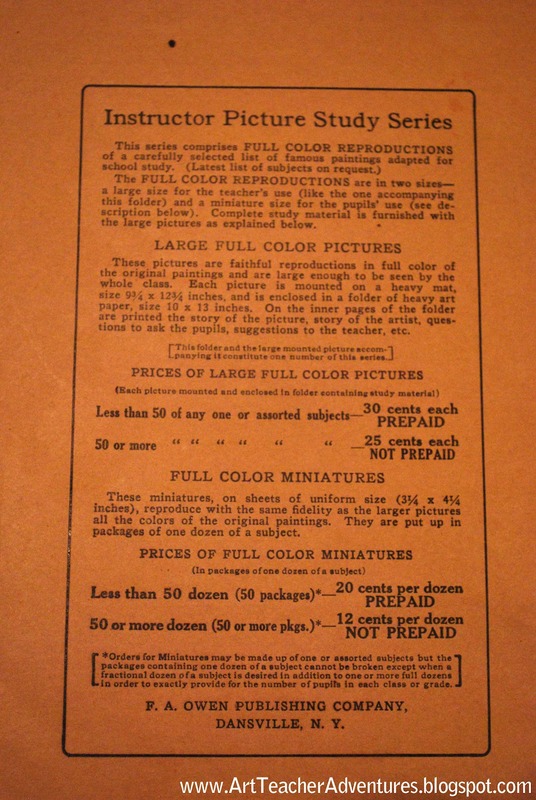 They help to keep the many horizontal lines of the picture from becoming monotonous. The artist was interested in showing light and shadow. See the dappled pattern on the road. The shadow of the house falls across the picture, and the girl's dress is dull in tone. The foreground would seem dark, if it were not for the gay flowers. Their hues of red, blue, yellow, and white are in delightful contrast to the softer shades which make up the remainder of the picture. Describe the kind of country which you see here. How do you know that this is a picture of Holland? What is the importance of canals to Holland? Can you name the trees bordering the canal? What is this quaintly dressed girl doing? How does she carry her burden? Describe the house. What do you suppose is the purpose of the mirror on the window blind? Is there sunlight in this picture? Where is it most beautifully shown? Name all of the details which you see in the background. What color on the horizon furnishes a note of contrast to the colors of the fields? How is a sense of distance given us? The other side of the folder has "Helpful Material for the Teacher" but I don't think I'll take the time to type that. The picture study was given to my Great Uncle Harlan for 3 years perfect attendance in 1933. When Harlan passed away a few months ago, my grandma thought I might like to have the picture study. Also inside the folder was an Easter drawing, typical of holiday Art at the time. 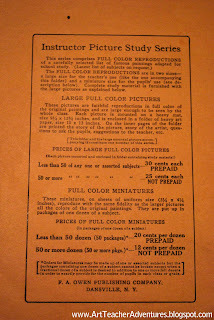 I was excited to find that I had something tangible to connect me to the history I was reading about. Katie - thanks for taking the time to post this. I love reading old art ed. materials. 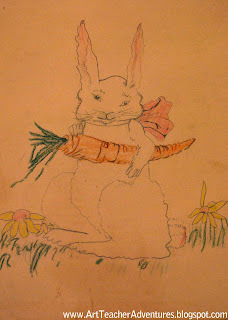 How special for you that it came with a piece of family art. it's amazing how far art education has come! thank you for sharing this...it's very interesting! Hi Katie, I think your blog is great! I'm an art teacher, and I am interested to find out where you are taking the class you mention in this post from? As you know, it's so hard to find classes that are relevant to what we teach! Thanks!